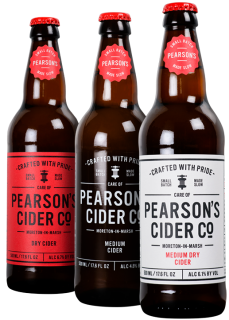 A Case of Dry Cider | Pearsons Cider. View Basket “A Case of Medium Dry Cider” has been added to your basket. 12 Bottles of Dry Cider. Pearson’s Dry Cider (6.7%) is a clear, lightly sparkling cider. It gets its distinctive ‘bite’ from the Redstreaks, while the vintage quality of Harry Master’s & Yarlington Mill give it a rounded, well balanced finish. It’s great with cheese, spicy food or just enjoyed on its own. Don’t forget to serve lightly chilled! Hey, want to see our cider in the flesh before you buy it? No problem, here's a list of some of the people we think are a bit good, so we asked them to stock our ciders - and they did !